Hi my name is Kathleen and they call me Lucky Lady... I have to say I honestly feel lucky, but the truth is, I've had my share of what some would call bad luck too. Once I learned about the law of attraction and our power as conscious creators, I realize it's not luck at all. All those times I thought I was being lucky, or unlucky, was the law of attraction at work. I just wasn't aware of it and how to use it. I am totally fascinated by the power of our minds, with the Law of Attraction, our power to manifest what we desire, and to deliberately create our lives. I love talking about it, reading about it, writing about it, and learning how to use it. I love inspiring, guiding, and supporting individuals all over the world in realizing their power to deliberately create whatever they desire, in other words, using the Law of Attraction to increase their luck and create their version of a lucky life. We were all born Lucky! The power is in us. We all have the power to deliberately create our lives and that includes you! I am also known as the one, the only, the original Comic Book Lady and one of the only women in the world to have sold over a MILLION individual comics. I am the owner and operator of a retail comic book business that I founded in 1980. Celebrating 35 years and my most successful year so far. I love using the Law of Attraction to increase my profits. I am a 1999 graduate of the Hoffman Process and an Access Consciousness Bars Practitioner. I am also a certified Life Coach. I appeared in the award winning film "The Comic Book Lady", and after 32 years of selling comics, I got to be in one! 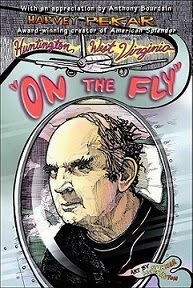 I was thrilled to appear in Harvey Pekar's Huntington WV, "On the Fly" Graphic Novel. Whenever I am not busy having fun with the law of attraction, coaching others, or selling comics, I can be found baking some of the most delicious pumpkin bread in the USA, running, playing the drums, taking road trips, attending concerts, or watching old movies with my Sweetie. "I am a Deliberate, Conscious, Effortless, Creator with the Universe, and when I Think, Envision, Believe, and Act as the Happy, Joyous, Healthy, Wealthy, Successful, Being that I AM, I create that as my reality!" Have you signed up to receive my Lucky Life Newsletter?